One of the goals I have for the year is try to expand the reach of family music (at least my sliver of it) into the broader world. I know that everyone is trying to do the same, but I really believe that we can let our freak flags fly a little bit louder, right? 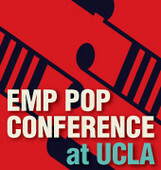 As part of that effort, I'm geeked to announced that I've been asked to participate in the country's pre-eminent conference on the study of pop music, the 2011 EMP Pop Conference at UCLA. This year's conference theme is called Cash Rules Everything Around Me: Music and Money, and, as you can probably guess, centers (loosely) on the intersection of the music and cash. The conference is in its tenth year, but this year they've moved it from Seattle (the Experience Music Project's home base) and are hosting it in Los Angeles). And the participants include David Lowery (on derivatives -- the financial kind, really), Holly George-Warren, Ann Powers, Chuck Klostermann, and more. Including me. That's right, I'll be presenting a paper called Pay Me My Money Down: Dan Zanes, They Might Be Giants, and the (Un)Surprising Resurgence of Family Music as part of a panel called "My Music Business," which'll feature a jazz musician, a Cajun-country folklorist, a music journalist, and me. Should be fun. I'm just waiting for my invite to TED.